The diplomatic crisis between Qatar and its neighbours is unlikely to have much effect on Singapore businesses. The tiny Middle East country is not a major trading partner, while its port is expected to carry on as normal. The biggest risk comes from the trade boycott of Qatar launched by Saudi Arabia, Bahrain and the United Arab Emirates (UAE). 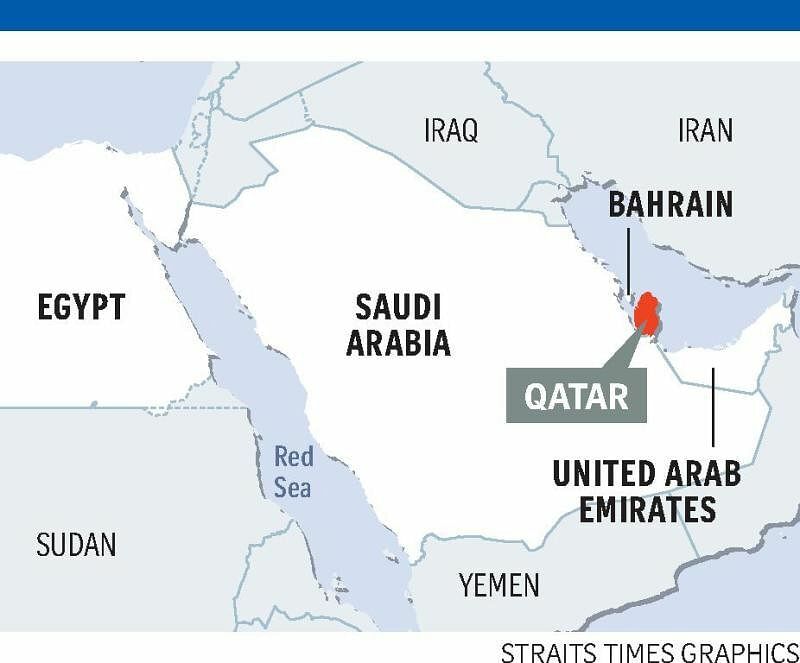 While the closure of the Saudi ports and Fujairah Port in the UAE is unlikely to significantly affect Singapore businesses exporting or importing from next- door Qatar, the situation could deteriorate if other nations, such as Egypt, join the boycott. Singapore businesses would then need to re-route goods and passenger travel through Kuwait or Oman, Singapore Business Federation chief executive Ho Meng Kit told The Straits Times yesterday. Kuwait and Oman are the last two members in the six-nation Gulf Cooperation Council (GCC) that still have ties to Qatar. Most of the Singapore business community serving the Middle East is based in the UAE. Direct flights to and from Doha were suspended by UAE- based airlines, including Dubai's Emirates and Abu Dhabi's Etihad Airways. Qatar Airways also suspended flights to Saudi Arabia, the UAE, Egypt and Bahrain. Both moves will likely inconvenience Singapore firms headquartered in the UAE for their Qatar subsidiaries, Mr Ho said. Keppel Group, which operates a waste management plant and a sewage treatment plant in Qatar, and a shipyard, said these are "proceeding as normal", and it is "monitoring the developments closely". Keppel has 1,800 workers in Qatar, including 40 Singaporeans and Singapore permanent residents. Accountancy firm BDO, with an office in Qatar, declined comment. Other Singapore firms with operations in Qatar - CrimsonLogic, a provider of e-government products and services, and Frasers Hospitality Group - also did not comment. Singapore has a free trade agreement with Bahrain, Kuwait, Oman, Qatar, Saudi Arabia and the UAE, which make up the GCC. The council is Singapore's fourth-largest trading partner after China, Malaysia and the European Union, accounting for 8.9 per cent of Singapore's total trade. Singapore's exports to Qatar are less than 0.1 per cent of total domestic shipments, though oil imports from Qatar comprise about 5.5 per cent of total oil imports here. If there are disruptions, Singapore can readily secure supplies from other oil-producing countries, said Maybank Kim Eng economist Chua Hak Bin. Saudi Arabia accounts for 11.3 per cent of Singapore's oil imports, and the UAE supplies 10.9 per cent. Liquefied natural gas (LNG) is an area of concern as Qatar supplies about a third of total global production. But "fortunately, the LNG market is currently well supplied. Singapore also imports natural gas from diverse sources - Indonesia, Malaysia, the US, Australia, Norway, Russia and Brunei", said OCBC Bank economist Selena Ling.